A unique resource available as a downloadable pdf. For over 60 years the URC has had a Covenant of Pulpit and Table Fellowship with the Protestant Churches in the Palatinate region of Germany, the ‘Evangelische Kirche der Pfalz’. Drawing on this partnership for the 100 years commemoration of the 1918 Armistice, the URC have been working with our German partners to produce a shared resource, which can be downloaded as two separate booklets. 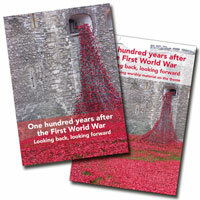 Entitled ‘One hundred years after the First World War: Looking back, looking forward’, the first booklet contains personal stories, reflections and poems written by British and German contributors. It includes a pilgrimage to the Somme this year undertaken by Pfarrer Martin Henninger from the Pfalz and the Revd David Pickering, Moderator of the Synod in Scotland. Their grandparents served on opposing sides during World War One. An accompanying booklet provides worship material: meditation, prayers, newly written hymns and biblical reflections and closes with a commitment to peace building. The publication of the resource is timed so that material from the booklets can be used in preparation for remembrance services. We hope this combined British/German initiative will bring a thought provoking dimension to the 100 year commemoration of the end of World War One. 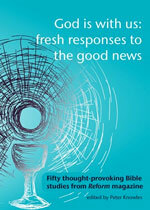 We're excited to announce God is with us; fresh responses to the good news; a selection of fifty Bible studies from Reform's popular Chapter and Verse column. This publication, edited by Peter Knowles, is a long-awaited compilation of some of the most thought provoking Bible studies published in Reform between 2008 and 2016. The book is organised thematically and the topics covered include Incarnation, grace, Kingdom and Meals & Justice. Described as an 'awesome piece of work' by the Revd Dr Peggy Mulambya Kabonde, General Secretary of the United church of Zambia -individuals and groups will find studies to surprise and challenge them in God is with us; fresh responses to the good news. Buy now for just £7; or in a special, limited, promotion, with the 2019 Prayer Handbook for just £11. Over 300 people gathered in the Skylark Church, Chelmsford on Wednesday 18th July 2018 - celebrating 25 years of the Ascension Trust and 15 years of Street Pastors - More than 50 Street Pastors, School Pastors, Prayer, Rail or Response Pastors were commissioned from all over Essex. Gwyneth was commissioned as a Street Pastor. Street pastors are the church out in the streets - to listen, care and help. Pastor means Shepherd, and these people show the compassion that was in the heart of Jesus. This is interdenominational. One speaker, a response pastor, had been at the Grenfell Tower Fire. He spoke passionately of his experience there, both the harrowing effects on the people involved and the opportunity for the response pastors to be Jesus to them in their utter despair and distress. The emotion of the experience was obvious in his words. The main speaker was Rev Les Isaac who founded the Street Pastors in 2003, and was awarded an OBE for his work fostering community cohesion in his role as Head of the Ascension Trust, the umbrella organisation that oversees the work of the Street Pastors. His charismatic address to the congregation in Chelmsford was simply awesome as he challenged everyone to play their part in taking the church out on to the streets. We pray for Gwyneth together with Judy and John who were commissioned as Street Pastors some years ago - all members of Christ Church URC Rayleigh. Each goes out in Southend-on-Sea on a Friday or Saturday night once or twice a month. The Church Tourism manager at the National Churches Trust is seeking more churches from acros s the denominations, who would like to be included on their new website, designed to promote churches to visit, which is called ExploreChurches. Valerie Jenkins who represents the URC on the Board of Trustees of the Churches Visitors and Tourism Association says: "to encourage visitors is part of the task of evangelism and by welcoming visitors we may be part of the first stage to transform those visitors into pilgrims". As in the past, Faith in Action Meeting and Commitment for Life have appreciated the practice of encouraging the congregations by updating them on the activities and others aspects of Commitment for Life. It is felt that in so doing the congregations are encouraged to keep playing their part, and for others to add their names on the list of contributors. To view the article written on behalf of Commitment for Life, see link below. Commitment for Life is the world development programme of the United Reformed Church. We encourage participating churches to take action, pray and give for people across the world but especially in our four partner countries/region of Bangladesh, Central America (Honduras, Guatemala. Nicaragua and El Salvador), Israel and the occupied Palestinian territory and Zimbabwe. We work in partnership with Christian Aid and Global Justice Now raising around half a million pounds a year from contributing churches. To find out more about the programme, visit the resources page click on the website link below. The United Reformed Church Past Case Review was an open invitation for anyone to raise concerns about the behaviour or conduct of anyone affiliated with the United Reformed Church since its formation in 1972. The open advertising phase of the Past Case Review is now closed. If you have a concern about past behaviours, please feel welcome to contact your synod's Safeguarding Officer or to contact the Assembly Safeguarding Officer based at United Reformed Church House. The PCR Learning Group is now analysing anonymised data to ensure that lessons are learned. A full report will be available in 2018. 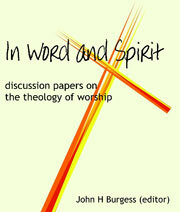 In Word and Spirit is a collection of discussion papers on the Theology of Worship by members of the United Reformed Church, previously presented to conferences and meetings of the Theology of Worship Group. The publication includes papers on the Holy Spirit, the Scriptures, preaching and worship in the post-colonial and contemporary contexts. The warehouses remain well stocked but we are very short of some items. Braintree Area Foodbank was set up four years ago in April 2012, under the auspices of The Trussell Trust to provide assistance for local people in crisis. The Foodbank has expanded to four centres, now including Christ Church, Braintree; Braintree Baptist Church; St Andrews Church, Halstead; and Witham Methodist Church. Since opening, the four centres have provided emergency food to over 10,020 people of whom 47% were children, and has distributed over 100 tonnes of food. Latest statistics published by Trussell Trust foodbank network show UK-wide foodbank figures for 2015-16 remain at record levels; national need is still not decreasing. Early findings in new data analysis of Trussell Trust figures by University of Hull suggests foodbank use is highest in areas where many people are unable to work due to illness or disability, are skilled manual workers, or are deprived. Michael Harvey suggests how we can create a culture of invitation in our churches with help from the Season of Invitation initiative. As I have travelled the world, I am yet to find an invitational church. - 'Is your congregation welcoming or... inviting? Welcoming! But how welcoming can we be if we are not inviting? We are welcoming as long as people can get themselves across the threshold of the church building, but we don't take our welcome out in the form of invitation. Something is going wrong at the threshold of our church buildings. I became fascinated as to why congregational members are not inviting. In fact I went on to find out that up to 95% of most congregational members are not going to be doing any inviting. "Why are we not inviting our friends to take a closer look at Christ and his church?" Here are some answers I receive regularly and some of my thoughts as I hear them. Back to Church Sunday has now run for 12 years and Season of Invitation for 3. This will be the final year that Season of Invitation will run in its current form, while the organisers are reflecting on what the next stage will be. Mission Committee decided not to sign up centrally this year, but to leave it to each Synod to decide whether they wanted to take advantage of the training and resource packs that Season of Invitation will offer to the URC this year. Season of Invitation training events are great opportunities for people from any denomination to come and learn about how to make the most of A Season of Invitation in their church context. Michael Harvey (co-founder of Back to Church Sunday) will provide interactive and relevant training, which will be useful for ministers and any churchgoers interested in making the most of opportunities to invite people to church.